10-8 Performance and Glock .40? As a full time firearms instructor and trainer, I feel that it is important to have at least one pistol in each of the common LE calibers in order to be able to speak intelligently to their performance aspects. Further, with the current volatile state of the ammunition industry, it is nice to have guns in various calibers so as not to become a victim to supply. I recently burned up a lot of my 9mm, but realized I still had a lot of .40 piled up from when I thought I was going to shoot a lot of Limited and Limited 10 in USPSA. 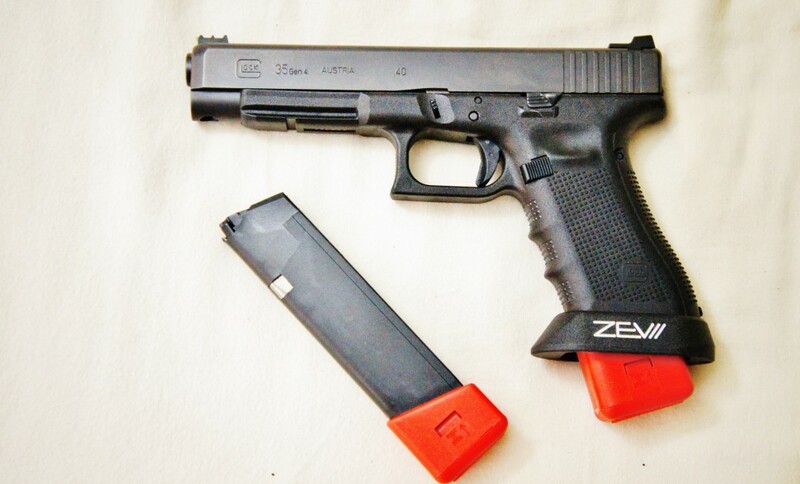 Thus enters this Glock 22. I get where he’s coming from, and I generally agree with his premise. I also agree that the Gen4 Glock 22 improves and solves a lot of the issues with the Gen2/3 22s, and with Hilton adding the Glock Tungsten Guide Rod that will soften up the recoil somewhat. My experience with the major caliber Gen4 guns has been with the 35 and the 21, I used the tungsten rod in both of those and it worked very well. Everyone knows I’m not a big fan of the .40. But I can understand Hilton’s reasoning in going with the Glock 22 as a test platform, since it’s very likely a lot of his students will be carrying that same gun. Personally, if I had to have a Glock in .40 S&W I’d go with the 35, because I feel (subjective) that the extra slide and barrel length do make the gun a bit more shootable. Either way, 10-8 Performance running Glock 40s still puts us in bizarro world. Gun News: Everyone panic, Obama Executive order bans import of new 7.62×39 ammo! I’ve shot full power loads in lots of .40 cal pistols. I don’t understand the objection to the recoil. Any 15 year old girl who likes to shoot can handle it. I understand and follow the principle of having pistols in various chamberings so you always have something to shoot available ammo. With 9mm, 10mm, 45 ACP, 357 Sig, 38 Super, maybe even 7.62X25 pistols out there, you don’t need a 40 if you don’t want one. Shoot it 9,999 more times and you’ll get it. I took a 3 day pistol class with a polymer .40 that was about 1000 rounds, my hands were pretty beat up at the end of it. The same class with a 9mm was no issue. Agreed Caleb, the .40 is a huge increase in recoil for little gain in balistic performance. I find it a punishing round. I shoot 200-300 rounds a training session, and with 9mm this is no issue at all. Through a .40 or .45 I am sore. For me, that is not worth it. There are shooters who can put 500 rounds through a 1911 in .45 ACP with no hand pain, so if such a thing does not bother your hands, more power to you. To each his own. The 40 cal has a secret, particularly if you’re a competitive shooter capping off hand-loaded ammunition… it can be tweaked to fire significantly softer then a 9mm (i.e. big/heavy bullet moving slowly). At the same time the 40 cal leaves a larger hole in paper; hence you’re able to see where on the target you’re hitting from further away. I do get it and agree if you’re shooting competitively or otherwise shooting hundreds of rounds per day, but the fact that a pistol makes your hand sick after 1000 rds. shouldn’t rule it out for general use or self defense, which is what most people buy a bigger bore pistol for. I don’t have or want a 40, I prefer 9’s and 45’s, but if someone wants a 40 for self defense and can run a few mags through it without flinching, I think they’re good to go. I carry and shoot a Sigma 40 ‘VE but I don’t shoot over 50 rounds in any practice session because of cost. I have a Gen4 G35 and prefer it all the time to my Gen3 G22. I do notice the G22 flips more than my G35. I also shoot a Gen4 G21 and love that gun as well. When the 40 first hit the USPSA Limited Div. environment I built one identical to my 45 pistol and spend a few days doing El Prez’s and other drills using reloads with the same power factor in both pistols. As much as I love the 45 I had to realize I could shoot better hit factors with the 40 especially on drills like the El Prez. The 40 has less torque for one thing. Shooting full power 40 in plastic carry guns is a different thing, people seem to have forgotten that there is a penalty paid in recoil with light weight pistols.